Winter Storm Winds Down, But Blizzard Conditions Persist : The Two-Way Blizzard warnings were declared from Rhode Island to parts of New Hampshire and Maine Tuesday. Since Sunday, parts of Connecticut and Massachusetts have had more than two feet of snow. Francisco Fernandez de Alba skis along a recently plowed road during a snowstorm in Providence, R.I., Tuesday. Parts of the state were buried under nearly two feet of snow by early Tuesday afternoon, and more was on the way. Coastal flooding and dangerous conditions were still affecting New England Tuesday evening, with blizzard warnings declared from Rhode Island to parts of New Hampshire and Maine. Since Sunday, parts of Connecticut, Massachusetts and other states have had more than two feet of snow. Strong winds were a main concern along the coast, as they drove flood waters inland and caused other problems. The National Weather Service says winds gusted at over 70 mph in Nantucket and Chatham, Mass. The winter storm is "starting to wind down," member station WBUR reports from Boston. But the station's meteorologist, David Epstein, says a few more inches of snow are still possible. And in Massachusetts and elsewhere, strong winds will continue to complicate efforts to clear roads. "The state's travel ban will be lifted tonight at midnight, Gov. Charlie Baker announced during an evening press conference." "Logan Airport will also resume service tomorrow with flights beginning at 6 a.m. and ramping up in the afternoon." A travel ban in Rhode Island was lifted at 8 p.m. 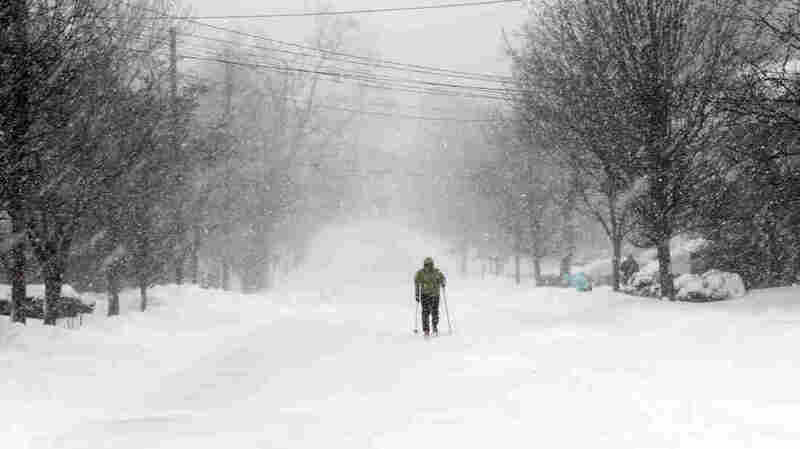 ET, according to Rhode Island Public Radio, which adds that "Providence broke its daily maximum snowfall record with 14.2 falling on Tuesday." The network adds that only four customers in the state were reportedly without power as of 5 this afternoon. Despite areas that received around 2 feet of snow in New Hampshire, less than 150 power outages were reported statewide, according to New Hampshire Public Radio. The Maine Public Broadcasting Network says the heavy snow and winds left some 1,200 customers of Central Maine Power without electricity. But the utility says it quickly brought that number down to around 150. An official in Maine also said something that those in other states have echoed, when he thanked residents for staying indoors and out of harm's way. "Traffic is very light on the roads," said Steve McCausland, of the Maine Department of Public Safety. "It's giving plow crews a chance to battle the storm. There have been a few slide-offs on the Interstate and the turnpike, but the numbers are very few."